This service operates from Leonay Public School and is available for children from any school in the area. We are open from 7.30am until 6.00pm during School Holiday periods including the pupil free days. We usually have one excursion each week on a Thursday. Annette has been running this service for many years and is ably assisted by Lauren, and our other staff such as Elaina and Cath. For attendance on the excursion the child needs to be registered for at least two days attendance that week, including the excursion day. When calculating the cost of Vacation Care we find that after deducting Child Care Benefits some parents can utilise a whole week’s attendance for their child for as little as $9.00 per week! A range of activities has been developed to cater for the special needs of this age group by Annette, Kim and their assistants who have had extensive experience in working with school age children. 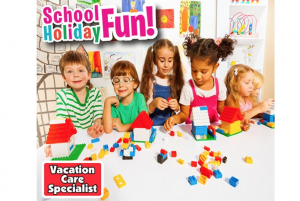 There are many activities available for the children attending this Vacation Care service. When booking in for Vacation Care the fees are to be paid in full before attending. The days for payment are advertised in the schools and payments made before the cut-off date are at a discount of $4.00/day to those paid after that date. Call Mandy or Annette on 4735-6565 for information or to make a booking.